Sweet Valentine Wall-E Cookies ~ Here's How To Make Them! 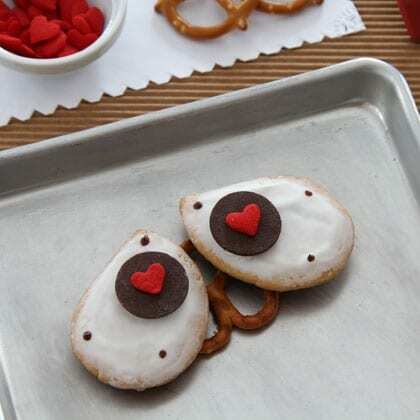 Sweet Valentine Wall-E Cookies ~ Here’s how to make them! Valentine’s Day is only two weeks away, and I’m still looking for cute treats to share with you all. Disney Family is FULL of good ideas this year! I found another adorable recipe for you to try, here you go! If the store bought brand of dough you use is too soft to hold the cookie shapes during baking, you can knead in a little extra flour to stiffen it before rolling it out. 1 Heat the oven to the specified temperature for the cookie dough. Meanwhile, print and cut out the template pieces. 2 Roll out the dough on a floured sheet of wax paper to ¼-inch thickness and then use the template and kitchen knife to cut out a bunch of WALL-E eyes (both left and right). Bake the cookies according to the recipe directions and then transfer them to the wire rack to cool completely. 3 Working with one cookie eye at a time, frost the surface with white cookie icing, and gently press a candy melt in place for the iris. Next, use a blob of cookie icing to “glue” a chocolate M&M’s candy atop the candy melt. 4 Melt a few chocolate Candy Melts in a microwavable bowl, heating them for 10- to 15-second intervals until they are soft enough to stir into a smooth consistency. Use the tip of a toothpick dipped in the melted chocolate to add three “rivets” to each eye. 5 Use more of the melted chocolate to stick each completed pair of WALL-E eyes to the top of pretzel.